The Center is eager to host workshops that serve its members, provide community education, or promote new ideas. Got a workshop you’re looking for, or one you’d like to teach? Please contact Riley Nicholson (riley@centerfornewmusic.com). Center for New Music’s Young Artist Workshop launches this year with acclaimed guitar group Mobius Trio. The day will culminate in collaborative performance featuring all participating students and the Mobius Trio, followed by a potluck reception with members of the Center for New Music. The final performance will be recorded and featured on Spotify New Music as part of a special release! Thanks to our sponsors, this program is presented FREE OF CHARGE, but space is limited to 12 participants, with 4 master class slots. The workshop is open to guitarists of all ages, but preference will be given to SF Bay Area residents ages 16-24. Participants will be sent scores and listening links to review in advance of the workshop. 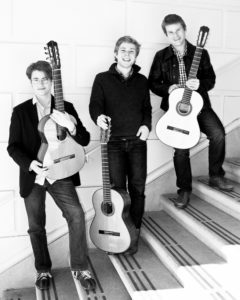 Described by the eminent Sergio Assad as “the most inventive and exciting young guitar ensemble today”, Mobius Trio has made it its mission to fully integrate the classical guitar into the 21st century’s nascent musical lexicon. The Trio exclusively performs music that they have commissioned; they seek to expand the guitar ensemble’s repertoire to encompass all of the myriad currents passing through contemporary art music. Mobius Trio has commissioned over a dozen composers in their first two years of existence, and that pace isn’t slowing. Recent commissions include Adrian Knight, Samuel Adams, and Belinda Reynolds, with more pieces and collaborations on the way. Mobius Trio was formed in 2010 by guitarists Robert Nance, Mason Fish, and Matthew Holmes-Linder while studying at the San Francisco Conservatory of Music. They started things off with a bang, commissioning and learning five pieces within the span of a couple of months, and performing many of those pieces at Washington, DC’s Kennedy Center the following April. Matt, Rob, and Mason are all accomplished, competition-winning guitarists in their own right, and they all live and work in San Francisco. This program is sponsored by Spotify and a grant from the Bill Graham Supporting Foundation of the Jewish Community Federation and Endowment Fund.